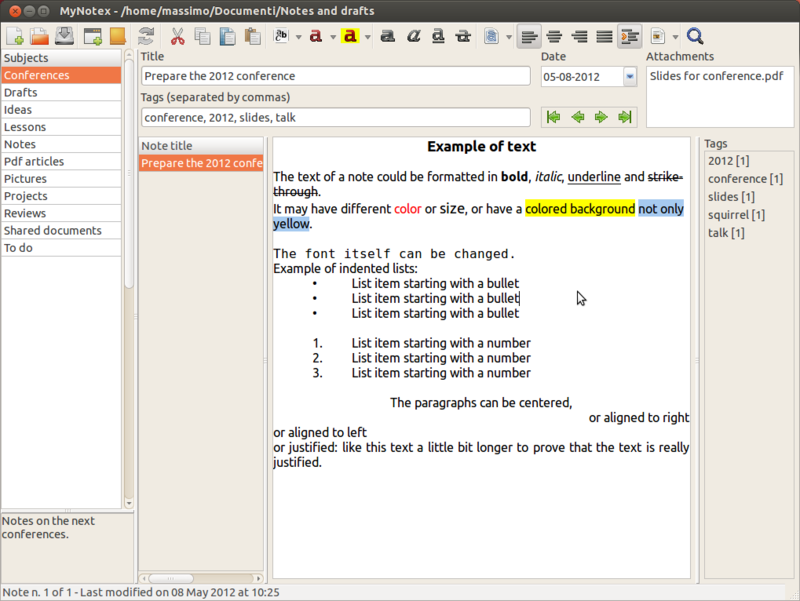 MyNotex is a free software for Gnu/Linux useful to take and to manage textual notes, also a large number of them. Notes are gathered under different subjects and are made by a title, a date, a tags (keywords) list and a free-length text. This may be formatted: it is possible to change the font name, size and color of a selected text and of its background, and also to set bold, italic, underline and strike-through; the text may have pictures within it. The software can manage paragraph alignment, bullets and numbered lists with automatic indentation. A single file of MyNotex contains various subjects and notes. write and keep reviews of books, movies, etc. create an archive of pictures, with the possibility to store the original file as attachment and a smaller version of it in the text of the notes, with proper explanations. share notes and documents with others. Possibility to insert images in the text of the notes, stored in the directory of attachments. Zoom of the text with Ctrl + mouse wheel, or Ctrl + +/-. Ctrl + Shift + T to insert or switch to "activity to do" symbol. Ctrl + Shift + R to insert or switch to "activity done" symbol. Icons for cut, copy, copy as html and paste. Popup menu for cut, copy, copy as html and paste. Send the current note to browser (for printing). addition of attachments with drag and drop (also more files at a time). Download deb package from here .Once you have deb package double click on it to install. After installing deb package if Unity is active, MyNotex will be configured to use traditional Gnome scroll bars instead of those of Unity, which do not work with this software. Anyway, there is no need to remove them. gsettings set com.canonical.Unity.Panel systray-whitelist "[‘mynotex']"
To accomplish Ubuntu rules, MyNotex will be installed in "/opt/mynotex".